I have a confession to make: I’m an addict. Every morning I wander to my basement gym, where I flip the power on my sauna, step inside, and sweat hard for thirty minutes. Knowing I can venture downstairs and enter a chamber that gives my body a myriad of benefits simply makes a sauna a daily must. JAMA Internal Medicine shows that regularly spending time in a sauna may help keep the heart healthy and extend life. Researchers from Finland tracked 2,300 men for an average of 20 years. They found that the more sessions per week men spent in the sauna, the lower their risk of sudden cardiac death and fatal coronary heart disease. The sauna also extended the life of participants with other illnesses, including cancer. The skin is a major detox organ, and sweating through skin is a critical human detox function, yet most people don’t sweat enough. Because of this, we miss out on a major source of toxin elimination: the skin. To combat these effects, an infrared sauna helps to purify the body from the inside out, eliminating compounds such as PCB’s, metals and toxins that are stored in fat cells, which can undergo lipolysis and release toxins upon exposure to heat. Growth hormone is crucial for repair and recovery of muscles, and research has shown that two 20-minute sauna sessions elevated growth hormone levels two-fold over baseline. Two 15-minute sauna sessions at an even warmer temperature resulted in a five-fold increase in growth hormone. And two one-hour sauna sessions for 7 days has been shown to increase growth hormone 16-fold! For an additional recovery benefit, sauna also increases blood flow to the skeletal muscles, which helps to keep them fueled with glucose, amino acids, fatty acids, and oxygen, while removing by-products of metabolic processes such as lactic acid and calcium ions. In The Annals of Clinical Research Volume 20, research results show the benefits of sauna for relief of pain and increased mobility. Pain relief induced by a sauna was attributed to an increase in the release of anti-inflammatory compounds such as noradrenaline, adrenaline, cortisol and growth hormones, as well as an increase in positive stress on the body, causing it to release natural pain-killing endorphins. More than 50% of participants reported relief of pain and an increase in mobility, most likely due to the fact that tissues comprised of collagen, such as tendons, fascia, and joint articular capsules, become more flexible at increased temperatures. Sauna can promote muscle growth and fat loss by improving insulin sensitivity and decreasing muscle protein catabolism. Intermittent hyperthermia has been shown to reduce insulin resistance in obese mice, and in this case insulin resistant diabetic mice were subjected to 30 minutes of heat treatment, three times a week for twelve weeks. The results were a 31% decrease in insulin levels and a reduction in blood glucose levels, both of which can contribute to an increase in muscle growth and an increase in weight control and fat loss. It has also been shown that a 30-minute intermittent hyperthermic treatment can cause a significant expression of something called ‘heat shock proteins’ in muscle, which is correlated with 30% more muscle regrowth after a week of immobilization. In other words, if you don’t exercise but you sauna instead, you can still maintain muscle! basophil counts was reported in the white blood cell profile, showing that sauna use stimulates the immune system. German medical research also shows that saunas are able to significantly reduce the incidences of colds and influenza, and other studies show that regular sauna bathing leads to a 30% less chance of getting a cold or influenza. When your body produces sweat via the deep sweating you experience in an infrared sauna, the rate at which dead skin cells are replaced can be increased. At the same time, heavy sweating helps to remove bacteria out of the epidermal layer of the skin and the sweat ducts. This pore cleansing also causes increased capillary circulation, which can give the skin a softer-looking, younger appearance. When you sweat, the movement of fluid to the skin delivers mineral-rich nutrients and also helps to fill spaces around the cells, increasing firmness and reducing the appearance of wrinkles. So by continually flushing waste through skin cells via the use of hyperthermia, you increase skin health, tone and color, and cleanse the pores. Not only does research show this skin rejuvenation effect, but I’ll admit that I’m quite frequently mistaken for Justin Bieber when I take a stroll down the street after my morning sauna session. So it must be working. Researchers have found that a sauna can help provide a deeper, more relaxed sleep, relief of chronic tension, and relief of chronic fatigue issues, most likely due to a release of endorphins from the sauna. As endorphins are released into your body, they create a soothing, tranquilizing effect that not only helps to minimize chronic arthritic pain and other muscle soreness, but can also help with relaxation and sleep. Research has shown 30 minutes of sauna treatment after exercise can cause an increase in oxygen consumption and red blood cell production that parallels the use of EPO. In the temperatures of an infrared sauna, your skin heats up and core body temperature rises. Then, in response to these increased heat levels, the blood vessels near your skin dilate and cause an increase in cardiac output. So with regular sauna use, you are training your heart muscles and improving your cardiac output. 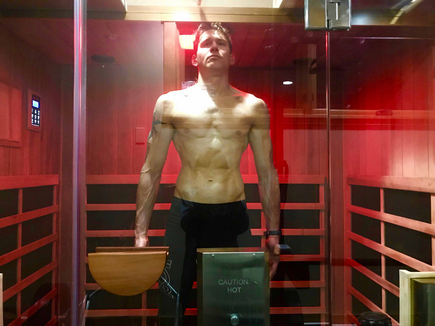 Multiple research studies have shown that hyperthermia via the use of a sauna can prevent protein degradation and muscle loss by triggering the production of heat shock proteins (HSPs), which are then used by your cells to counteract potentially harmful stimulus, including environmental stress from pollutants, toxins, heat, cold, exercise stress and more. Whenever a cell is exposed to an unfriendly environment, your DNA “separates” in specific regions and begins to read the genetic code to produce new stress proteins, including these HSPs. What this means is that exposure to sauna heat can induce a hormetic response which promotes the production of HSPs crucial to stress resistance, prevention of free radical damage, support of cellular antioxidant capacity and repair of damaged proteins. So, can you blame me? I’m addicted to my sauna and knowing these 10 benefits, I feel very good about myself when I walk out of my daily sauna session. If you’re up for the challenge, I’d recommend that for the next thirty days you try the Finnish practice of visiting a sauna four to five times a week for twenty to thirty minutes. Ben Greenfield is the New York Times bestselling author of the book Beyond Training. Nutritionist, trainer, health coach, podcaster and high-performance endurance athlete, Ben can be found each morning working out in his Clearlight Jacuzzi Sanctuary-Yoga sauna and at bengreenfieldfitness.com. Clearlight Saunas is proud to be the only sauna used and recommended by Ben Greenfield. Clearlight Saunas have a 100% lifetime warranty and come in a variety of sizes, shapes & budgets. To find the best sauna for your home and your health, please visit www.HealwithHeat.com and speak with a sauna specialist at 800.317.5070.